This is the time for the Christmas song. There are many diehards that have had their fingers just itching to press the play button of the Christmas radio station even weeks before Thanksgiving. Makes enough sense, but the endless barrage of the holiday tune is a bit much to take at times (how much can you listen to that Mariah one – really). While the Christmas spirit is very lovely, it is a total loss to ignore anything else that is equally as beautiful at this time of the month – the winter song. Winters in Britain are completely unlike the ones I survived as a kid in Wisconsin. There’s certainly a lot less snow for one thing, and it’s quite a lot warmer in England. But there’s something in the air here that doesn’t exist in a tumultuous Midwestern winter – the damp. Despite being moderate pretty much all winter there’s this terrible dampness that I believe has lead me to procure some of the worst colds of my life. Even our food gets damp. Somehow, this is charming. Everything can be charming when you’re an expat! There is one song, though, that captures the mood of both winters to me: one scene filled with several feet of snow that shines endlessly in the sun and the other a dark and damp cozy place with simmering rain. 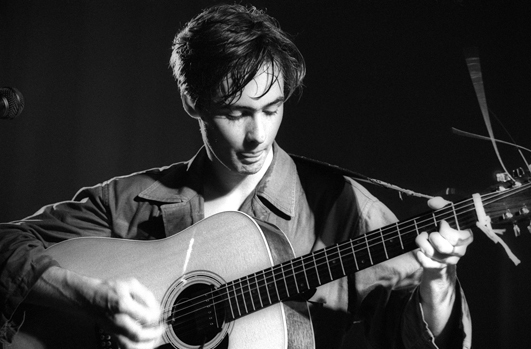 That song is Aztec Camera’s jangle pop track ‘Walk Out to Winter’ from his 1983 debut album High Land, Hard Rain. The sound is something truly great in this song – so light and shiny that is feels of winter. The lightness of the chords just gleam off the guitar (in a figurative way, I think). Johnny Marr has been quote admitting that after hearing ‘Walk Out to Winter’ he was jealous of Roddy Frame’s jangle pop guitar, so he wrote ‘This Charming Man’ – which is arguably one of the Smith’s best tracks ever written. The video, of course, is impossibly twee like much of what came out of Scotland at the time. Where Scottish Roddy Frame runs amok on a beach and fun fair while being pursued by a rather elusive older woman. Personally, I believe that the album version is superior to the single but there is plenty of charm in each. Long live the Winter song! There’s plenty of room for both, especially if anyone is feeling a bit fatigued in even the most cheeriest of times.